As a young dentist in the late 1980s, Dr. Marc Wilk realized that he needed to embrace technology in order for his practice to grow. He’s worked with Henry Schein TechCentral and Dentrix from their earliest days, when backing up data still required the clicking of a desktop icon. Here, Dr. Wilk discusses why he relies on TechCentral’s latest innovation, Hybrid Backup Service, for data backup, encryption, and verification. Dentists often take their data backup for granted. They always think it will be there but rarely verify it. I remember after Hurricane Sandy many people I knew thought they had insurance for a catastrophe. That was until they had to fully examine their policies. Often the coverage was not what they originally thought it was. Now think if that happened at your office instead of your home, faced with the possibility of losing all of your patient data. When was the last time you verified your backup? What would you do if you lost your patient data? It almost happened to us. In 2014 we had an equipment failure with our 18-month-old server’s RAID5. Usually only one disc fails and that’s recoverable. In this case, ALL 5 discs failed. I was panicked but knew my backup system was sound—or so I thought. When we installed our server I had the idea of keeping an old server as an external hard drive backup. We could mirror the new server to it and in case of emergency, map all the workstations to the old server and we would be up and running. After the meltdown we had the unfortunate opportunity to put my plan into action. I mapped all the workstations to the old server and logged in to Dentrix, but when I opened a patient chart there were no images. Now real panic set in. I called Dentrix support and we found that there was a flaw in the backup. The images were there, but a small file of metadata was corrupted. For all intents and purposes, this was the same as having lost all of our images because the computer didn’t know where to place the thousands of images that were stored. After trying unsuccessfully to recover this metadata, a Dentrix developer had the idea of extracting this file from our Dentrix eBackup and then importing it into the old server. After 4 days of work, Dentrix extracted the file and completed the import. After a restart we held our breath, opened Dentrix and the images were recovered! We were saved but I couldn’t help thinking, what if Dentrix hadn’t saved us? What would we have done? Other backup systems I had used had very manual processes that required you to copy folders or click on an icon daily to initiate a backup of your data. It was very inconvenient. There were times I left my office after a 10- hour day and realized I had to return to do the backup. About a month ago, Henry Schein TechCentral told me about their new Hybrid Backup Service. In one package, you have a backup device that is plug-and- play and specifically formatted to automatically back up your server. It then transmits an identical copy of your data to your cloud storage. That way it is stored in 2 locations, plus, TechCentral support is monitoring your backup so you can be sure your data isn’t getting corrupted during the backup process. In the event of equipment meltdown, all you have to do is get a new server, call TechCentral support, and they’ll restore everything. It’s much faster than a regular mini-server and formatted more optimally to get you back up and running. Think about losing all of your patient data—every image, document, every bit of information including your appointment book and account receivables. All gone. When you need a backup, it’s important to know you have something reliable like the TechCentral Hybrid Backup Service. Dr. Wilk graduated from Columbia University School of Dental and Oral Surgery in 1987 and completed his general practice residency in dentistry at St. Luke’s- Roosevelt Hospital Center in New York City the following year. 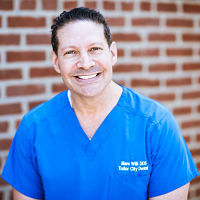 He then joined Tudor City Dental, where he currently practices and serves as the office point person on practice management systems.